Flicking through the 2013 Venice Biennale catalogue I came across this, 'Controller of the Universe' by Damian Ortega. Unfortunately this work didn't actually feature in this year's Biennale, an outdoor landscaped, site-specific piece called 'Communications System' was exhibited instead. So despite not coming across any of the artist's works in Venice I'm still very excited to discover the specific piece of work pictured above and wanted to briefly give it a mention. 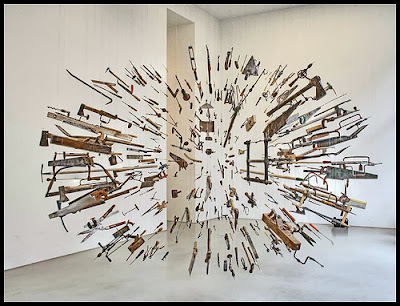 It reminds me of Cornelia Parker's exploded shed but with tools! 'Controller of the Universe', (taking the title for the moment out of the mix and looking at the work visually) makes me think about the 'Big Bang' which gives birth to a string of associations leading from the Big Bang, creation of the world/mankind to man's origins through tool use, making, evolution, production, industry etc. etc. And without having actually experienced/seen the work I'd hazard a guess that it has a feeling of being sort-of playfully amusing but also slightly threatening in the sense that the tools are 'coming out at you' in an explosion. If I include the title, I'd probably question who is the 'controller' referred to in the title, is it us, the makers of tools? Did we create this explosion (which could act as a scene of both creation and/or destruction)? 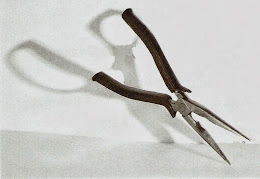 Who wields the tools in society and are they the ones in control (and what is it they are in control of?) And is the person who uses the tools often the person in control? Suddenly it all feels as though it could begin to get very political. Maybe that's what Ortega intended? Described as a de-assemblage artist, Ortega creates suspended sculptures using everyday /found objects from pick-axes to bricks and tortillas. Sometimes he deconstructs the objects to expose their inner components, as he did with his 2003 entry to the Biennale, taking apart and reassembling a suspended Volkswagen Beetle. The resulting work looked a bit like an Air-fix kit or mechanic's manual and offered a new way of seeing the familiar mass-produced car as well as commenting on its production that is now 'en masse' in Ortega's native Mexico (alternatively, this work has been more succinctly described as an example of 'how regional culture affects commodity consumption'). Even more exciting to learn Ortega was taught by artist, Gabriel Orozco and whose peers include Francis Alys, (all also working/living in Mexico). 'Hmmmmm,' I think, 'its all beginning to make sense'. There are connections between Orozco's work and Ortega's, in their use of commonplace materials, wit and political themes. Although I undoubtedly need to and want to look into this in a lot more detail.